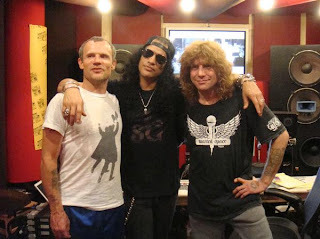 Slash has revealed that he recorded a track with Dave Grohl and Duff McKagan last night (September 22). The former Guns N' Roses and current Velvet Revolver guitarist revealed the news on his Twitter.com/slashHudson account. Writing on the page, he said that Grohl plays drums on the track, while McKagan plays bass. "Great jamming w/Duff & Grohl tonight, the track is a killer instrumental, very heavy," he Tweeted. Slash's solo album – called 'Slash & Friends' – is reportedly due for release in early 2010. The album is confirmed to feature a number of guest musicians, including Iggy Pop, Nick Oliveri, Ronnie Wood, Flea, Jason Bonham, Fergie and Maroon 5 singer Adam Levine.